We know that searching for the right home in the right area is important to you. 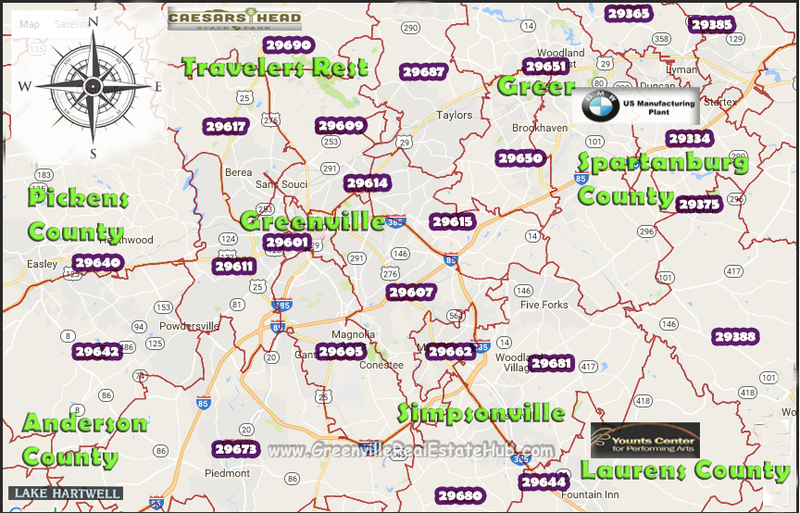 To assist you in your search for Greenville South Carolina real estate, below is a zip code map of the entire Greater Greenville area. For your convenience, we have also provided direct property search links to all the major zip codes in Greenville, Spartanburg, Pickens, and surrounding Upstate counties. Contact us for personal assistance to find a home in a zip code located outside the perimeter of the Greater Greenville area that is not listed. The list of Greenville County Zip codes below includes homes for sale in downtown Greenville (29601), homes in other Greenville areas like 29605, 29607, 29609, 29611 and 29615. It also includes homes in Simpsonville (29680 & 29681), homes in Greer (29650 & 29651), homes in Piedmont (29673), Mauldin (29662), Travelers Rest (29690), Fountain Inn (29644), and others. Some of the most popular master planned communities are found in Greenville, Simpsonville and other areas within Greenville county. Some of the popular Spartanburg county zip codes are located in Duncan (29334), Greer (29650 & 29651), Lyman (29365), Spartanburg (29301, 29302, 29303, 29306, 29307), Boiling Springs (29316), Chesnee (29323), Inman (29349), Landrum (29356), Moore (29369), Welford (29385), Woodruff (29388), and other areas. BMW manufacturing plant, Amazon fulfillment center, and other popular companies are located in Spartanburg county. Here is the complete list of homes for sale by Spartanburg county zip codes. Pickens county zip codes are located in areas like Easley (29640 & 29642), Liberty (29657), Pickens (29671), Sunset (29685), Central (29630), Clemson (29631), and others. There are some beautiful neighborhoods in Easley and some of the other areas in Pickens county. Laurens county zip codes are located in areas like Whitmire (29178), Clinton (29325), Cross Hill (29332), Enoree and Cross Anchor (29335), Joanna (29351 & 29355), Laurens and Watts Mill (29360), Fountain Inn (29644), and others. Whether exploring the outdoors, relaxing by the lake or river, or searching for a home that offers a short commute to work, Laurens County has many properties for sale that will suit your needs. The list of Anderson County Zip codes below includes homes for sale in Anderson/Northlake (29621), Centerville (29625), Homeland (29626), Belton (29627), Fair Play (29643), Pelzer (29669), Clemson (29670), and more. Clemson University is located in Anderson county as well as many recreation outlets. Homes for sale in Anderson County vary from waterfront lake retreats, to magnificent country home sites, or homes in the city areas. The list of Oconee County Zip codes below includes homes for sale in Fair Play (29643), Mountain Rest (29664), Newry (29672), Salem (29676), Seneca (29678), Westminster (29693), Wahalla (29696), and more. Oconee County is situated in a picturesque region of the Upstate of South Carolina. Bordered by the beautiful Blue Ridge Mountains, abounding in lakefront or lake access properties, and affording space to commune with nature, there are homes available to fit any lifestyle.